Sega's annual game show runs from April 14 to 15. Sega Fes 2018 will run from April 14 to 15 at Bellesalle Akihabara in Tokyo, and host a variety of Sega-related stage events, all of which will be live streamed. Those willing to travel to Akihabara can attend the event in person free of charge. It will run from 11:00 to 19:00 JST on April 14, and 11:00 to 18:00 JST on April 15. Read more information here. 10:30 to 11:00 – Thanks to All Sega Fans: Sega Fan Meet-Up 2018 (YouTube, Niconico, Twitch) – An event where Sega will thank all of its fans. Sega Holdings chairman, executive director, and CEO Hajime Satomi will appear to announce the opening of Sega Fes 2018, as well as make it a place where several “answers” can be shown in response to the passion and expectations of all the Sega fans. 11:30 to 12:30 – Border Break for PlayStation 4 New Information Announcement Stage (YouTube, Niconico, Twitch) – The appeal and latest information on the PlayStation 4 version of Border Break. Additionally, there will be answers to various questions that were collected during the open beta test. Presenters include Seiji Aoki (producer) and You Momotani (director). Misuzu Araki will MC. Guests include Yuu Serizawa, Madoka Asahina, Kanako Takatsuki, Koyomi, and Kaname*. 13:00 to 14:00 – Soul Reverse Zero Stage (YouTube, Niconico, Twitch) – The first reveal of information about the second part of the story scheduled to be implemented this spring, as well as new collaboration-related information, a public post-recording corner, and gameplay. There will also be postcard presents with serial codes attached for attendees. Presenters include Norikazu Hirai (Soul Reverse Zero producer). Guests include voice actors Nanami Yamashita, Yuuki Yonai, and Saki Minami. 15:00 to 16:15 – Readyyy! Golden Stage Vol. 0: Our Official Start! (YouTube, Niconico, Twitch) – In addition to all 18 newcomer cast members, and MCs Masaya Matsukaze and Yohei Azakami, this stage event will debut previously unannounced game information, and 10 songs will be performed live. Guests include voice actors Tetsuei Sumiya, Norihito Hase, Hayato Komiya, Jun Endo, Noriaki Kanze, Ryuichi Sawada, Tomohiro Ohmachi, Hattori Sonosuke, Shuichiro Umeda, Haruto Kuroki, Issei Furuta, Shun Yasuda, Taiki Bito, Shuma Konoe, Masamu Ono, Katsuyuki Miura, Yuuki Sakakihara, and Fumiya Tanaka. 17:00 to 18:00 – Sonic DJ Live (YouTube, Niconico, Twitch) – A Sonic the Hedgehog music-only DJ concert featuring series sound director Tomoya Ohtani. The first half will be focused on DJing, while the second half will feature guest vocalist Jon Underdown. 10:30 to 11:00 – Merchandise and Attractions Overview (YouTube, Periscope) – An overview of the items on sale at Sega Fes, as well as attractions such as the Big UFO Catcher, Gigantic Mega Drive Controller, and more. 11:20 to 11:40 – Ange Vierge: Girls Battle (YouTube, Periscope) – Featuring guests Yuuka Aisaka and Yoshiko Ikuta, this stage will deliver information on the “Progress Popularity Poll” currently going on in the game, as well as the “All Circle Summit Showdown E.V.E.” Additionally, there will be advanced release information during the booth live stream. 11:40 to 12:00 – Chain Chronicle Official Broadcast in Akihabara at Sega Fes 2018 (YouTube, Periscope) – Yurika Takagi, who voices Alice in Chain Chronicle, will take on an official broadcast-exclusive mission with a party formed of Sakura Wars, Shining series, Valkyria Chronicles, and Sega Hardware Girls characters. If she succeeds, viewers will get five SR characters as a present. There will also be information on the second half of Chapter 7. 12:00 to 12:20 – Let’s Create a Pro Soccer Club! Road to World (YouTube, Periscope) – A full overview of the currently in-development Sakatsuku: Road to the World with guest and former soccer player Tatsuhiko Kubo, who also appears in the game. Presenters include producer Riichiirou Yamada. 13:20 to 15:00 – Sega Information Station (YouTube, Periscope) – Various information from each company within Sega Group with developments and guests. 15:30 to 17:30 – Phantasy Star Online 2 DFG Sega Fes Official Broadcast (YouTube, Periscope) – At the Phantasy Star Online 2 live stream and event, the three members of the Dark Farce Girls (DFG) will play the newly launched Phantasy Star Online 2 Cloud for Switch. Featuring Dark Farce Girls Marika Kouno, Riko Kohara, and Yurika Takagi. 18:00 to 18:30 – Persona 3: Dancing Moon Night / Persona 5: Dancing Star Night (YouTube, Periscope) – Atlus producer Kazuhisa Wada introduces Persona 3: Dancing Moon Night / Persona 5: Dancing Star Night, which is playable at Sega Fes 2018. 10:30 to 12:30 – Puyo Puyo Championship at Sega Fes 2018 (YouTube, Niconico, Twitch) – The first tournament of Puyo Puyo series’ Japan e-Sports Pro License players with a grand prize of one million yen. Featuring Puyo Puyo series general producer Mizuki Hosoyamada and guest Teiichirou Sunagawa of Yofukashi no Kai. 13:00 to 14:00 – Dx2 Shin Megami Tensei: Liberation Stage (YouTube, Niconico, Twitch) – The latest news on future updates and the augmented reality functionality that was previously announced. Featuring protagonist voice actor Yuuki Ono, freelance writer Mafia Kajita, and cosplayer Rochelle Kashou as a Pixie. Chief producer Riichirou Yamada will also be present. 14:30 to 16:30 – Phantasy Star Online 2 Station! Sega Fes 2018 Special (YouTube, Niconico, Twitch) – The official broadcast for the latest information on the online RPG Phantasy Star Online 2, this time hosted at Sega Fes 2018. In addition to MC Ayaka Suwa and Nasu Nakanishi, Claris Claes voice actres Aoi Yuuki will also be featured. Presenters include Phantasy Star Online 2 series producer Satoshi Sakai and series director Yuuya Kimura. 17:00 to 18:00 – Persona 3: Dancing Moon Night / Persona 5: Dancing Star Night and Persona 5 the Animation Special Stage (YouTube, Niconico, Twitch) – A talk show featuring voice actors Jun Fukuyama (Protagonist / Ren Amamiya) and Aoi Yuuki (Futaba Sakura) as guests, and a mini-concert featuring vocalist Lyn. Persona 3: Dancing Moon Night and Persona 5: Dancing Star Night producer Kazuhisa Wada will also be featured. 10:00 to 11:00 – Merchandise and Attractions Overview (YouTube, Periscope) – An overview of the items on sale at Sega Fes, as well as attractions such as the Big UFO Catcher, Gigantic Mega Drive Controller, and more. 11:00 to 11:50 – Soul Reverse Stage: Soul Reverse Time!! at Sega Fes 2018 (YouTube, Periscope) – The official broadcast of the new arcade game Soul Reverse, this time at Sega Fes 2018. Live gameplay from writer Bunbun Maru and gamer talent Riran with producer Sakai. 12:10 to 13:00 – Star Horse Pocket (YouTube, Periscope) – Using the improved simulation races of the late April-due version update, the April 15 “GI Satsuki Sho” will be predicted. Future event information will also be announced. Presenters include director Yoshihiro Okabayashi and image character Hihin Maru. Voice actress Ayaka Imamura will MC the event. 13:00 to 13:30 – Kyoutou Kotoba RPG Kotodaman (YouTube, Periscope) – The latest information on Kotodaman ahead of its official service launch on April 16. Additionally, live gameplay of the final version with all the character voices included. Presenters include producer Taira Nakamura and assistant producer Nomekata, and guest voice actress Mami Yamashita. 13:30 to 15:10 – Sega Information Station (YouTube, Periscope) – Various information from each company within Sega Group with developments and guests. 15:40 to 16:20 – Classic Game Stage (YouTube, Periscope) – An introduction to various initiatives related to Sega’s classic games while looking back on a variety of titles with MC8bit and M2’s Naoki Horii. There will also be many new announcements. Presenters include Sega Games’ Kagasei Shimomura and Yosuke Okunari. 16:50 to 17:30 – Valkyria Chronicles 4 (YouTube, Periscope) – Live gameplay of the “Two Valkyrias” downloadable content for the PlayStation 4 version of Valkyria Chronicles 4, which is available now, as well as additional new information on the Switch version. Featuring producer Kei Mikami. Singer and novelist Hashiyan Kosaka will MC the event. 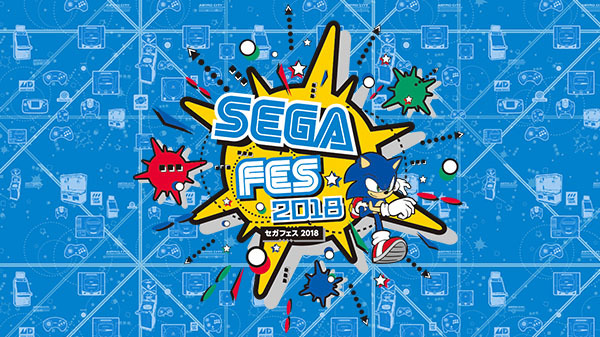 Visit the Sega Fes 2018 official website here.